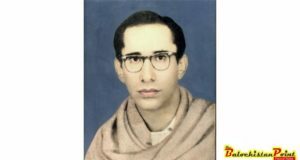 For years celebration of Balochi Culture day has remained a great and continual occasion for Baloch tribe. 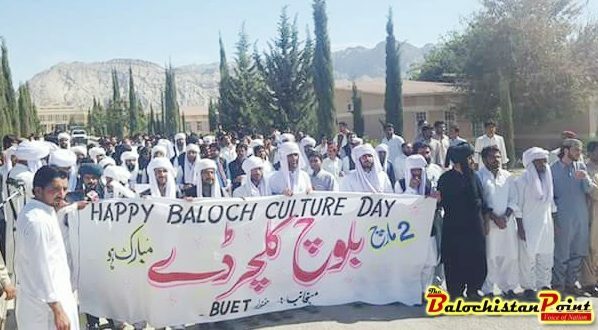 In order to memorize that eternal love for culture with high zeal, trend and efforts of Students Action Committee (SAU) & Baloch Students Action Committee (BSAC) arranged Balochi Cultural Day celebration on 2nd March. This all was done in the patronage of Vice-Chancellor Balochistan University of Engineering & Technology Khuzdar. All this day was busy with Balochi traditional activities. In the cultural walk the Vice-Chancellor addressed to the students and highlighted the numerous features of Baloch Culture and history. After successful walk, all the participating students and faculty moved to Mir Ghaus Bakhsh Stadium Khuzdar to participate in various activities. In the stadium, display of Balochi costumes and musical shows, including a traditional dance in which participants swap and clap at the beats of drum. Children and eminent men wore Balochi clothes and performed wonderful activities for the promotion of their culture. After suffering millions of hardships by Baloch people still, love for cultural celebration keeps a value for long lasting centuries. This nation always showed perseverance regarding their cultural celebration activities from pre-centuries. A musical concert in the auditorium of the university was also a part of this day. In which prominent singer “Lateef Noori” from Naushki sang cultural songs in the pride of Baloch people. All the credit goes to Vice-Chancellor and organizing members of SAC & BSAC for successful arrangement of this epic event.